The funeral of former boxing champion Hector “Macho” Camacho erupted into chaos after a fight broke out between Cynthia Castillo, a woman claiming to be his girlfriend, a former lover and his sisters. Family, fans and fellow boxers had gathered in San Juan, Puerto Rico on Tuesday to say goodbye to the slain former world champion fighter, known for his flamboyance in and out of the ring. The brawl broke out after 28-year-old Cynthia Castillo, dressed in a pink T-shirt emblazoned with Hector Camacho’s face, leaned down to kiss his body in the open casket. Cynthia Castillo then walked into an area reserved for family – causing tensions to spill over with the boxer’s sisters and former lover, 50-year-old Gloria Fernandez. The scuffle migrated outside the memorial service, followed by a pack of journalists brandishing camera phones and police who separated the women. Cynthia Castillo said she was the boxer’s girlfriend before he died, calling him “my partner, my friend, my brother”, according to El Nuevo Dia. Police urged the young woman to leave the scene while the sisters returned to the service. There were emotional scenes throughout the day as members of Hector Camacho’s immediate family approached the coffin. The boxer’s mother Maria Matias wept and caressed her son’s face in the coffin, which was draped in a Puerto Rican flag. “They killed him,” she wailed at one point. 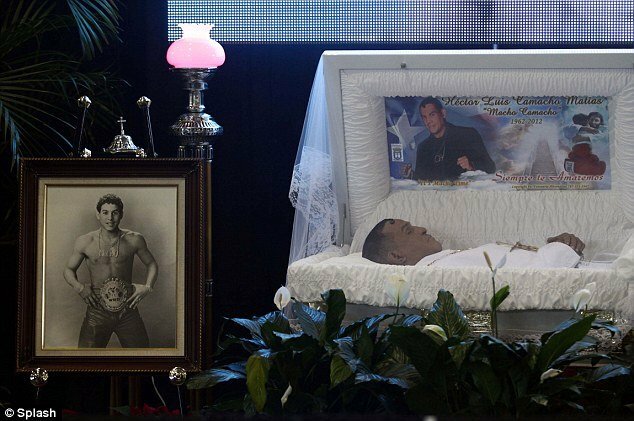 Hundreds of people filed past Hector Camacho’s open casket, displayed inside a gymnasium decked out for the occasion with black carpet and curtains. The boxer wore white, along with a large gold crucifix and a necklace spelling out his nickname, “Macho”, in capital letters. Hector Camacho was shot on November 20 while sitting in a parked car with a friend outside a bar in his hometown of Bayamon. The friend died at the scene and the boxer three days later after doctors removed him from life support. Police have said they have suspects but have not yet arrested anyone for the shooting. After the family, came a cross-section of Puerto Rican society that included parents with young children, the elderly, road crew workers in neon safety vests, U.S. soldiers in uniform and a who’s who of Puerto Rican boxers. “Everybody loved him here in Puerto Rico,” said Henry Neumann, the secretary of the U.S. island territory’s sports and recreation department. Hector Camacho, who was 50 when he died, left Puerto Rico as a child and moved to New York. He went on to win super lightweight, lightweight and junior welterweight world titles in the 1980s and fought high-profile bouts against Felix Trinidad, Julio Cesar Chavez and Sugar Ray Leonard. He had a career record of 79-6-3 and was a showman in the ring, chanting “It’s Macho time” before fights and wearing garish jewelry. He battled drug and alcohol problems throughout his life and had frequent run-ins with police. Hector Camacho was sentenced in 2007 to seven years in prison for the burglary of a computer store in Mississippi. While arresting him on the burglary charge in January 2005, police also found the drug ecstasy.